Windows 10 is the future, it is getting better. Microsoft under Satya Nadela’s leadership is achieving a lot of success in the technology world and Windows 10 is just another achievement. Right now, it is available free to use under Technical Preview version and here I got a review of the same. I’ve been using Windows 10 for few of my primary productive hours every day, and I can say that this version of OS may give me a reason to make the switch again. Did I forget to tell you that I recently switched to Mac platform? You can find my MacBook Air review here. These stories of switches are everywhere, at least among users who got lots of productive works to do. They are all switching away from Windows, and this may be the last chance for Windows to convince them. Let’s not vanish in that discussion further and start with the review of Windows 10 technical preview, so far. If you’re interested in testing and using it on your own, then you can get the ISO file from official Microsoft website here. You don’t need to pay anything for now. It is also confirmed that Microsoft is going to make the Windows 10 a free upgrade for all genuine Windows system owners. I begin installing 64-bit version of the OS and it took around 25 minutes to get everything setup for the first time. First thing I worth noticeable was that Microsoft has used a very new approach to the installation process. Earlier we used to go through actual booting during the installation process, but not anymore with this upcoming OS version. 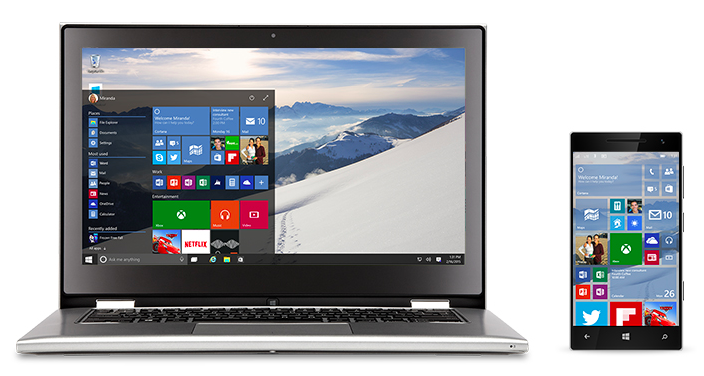 Windows 10 is a brand new experience and it starts right away from the installation process. I’m pretty sure you’re going to like it. My computing system was earlier running Windows 7, and installation process of Windows 10 was just like adding a theme on top of it. Yes, just like we used to do in the age of Windows XP. Remember adding Windows 7 or Vista theme? It’s exactly the same, at least from user’s point of view. And this is good. We don’t need to go through any creepy screen instructions at all. Also, there are lesser chores for us to perform during the process. After booting the fresh OS, it also installed new available updates. It took a lot of time because of dependency on active internet connection. In my case, PC was connected to 4MBPS broadband connection. But it still managed to increase total installation time by 10-15 minutes. So, the overall time required to get the system ready at your end, will depend on the speed of internet connection. When it comes to Windows, first impression starts with Start. A part (sort of habit) which Microsoft tried replacing with Metro Start but failed in the very first attempt. Now in Windows 10, Start button is back, where it belongs. But it isn’t same anymore. The design and visuals are still inspired by Windows 8.1 but functionally it works like it’s from Windows 7. New Start comprises of two sections. One part compiles of Software and Program shortcuts while the second one comprises of Live Tiles (Just like Windows 8.1). The First part isn’t changed, there are only visual improvements, which overall looked good but the main attraction was in second half. I was allowed to Pin tiles, which also fetches live data. I can add or remove tiles and getting used to didn’t take that long. Also, the full screen Start is also there, just like it was there in Windows 8.1. Next attraction was sharp edges around any Window screen. No matter whether it is a File Explorer or Media Player or Skype or any other software or application, edges around are sharp, and they look good. I also noticed refreshed Icons of Homegroup, Date and Time and lots of new entries in Setting (Control Panel) part. Notification centre also managed to gain my likeness during my naive hours. As said earlier, it just works like a skin on your previous OS status, so you won’t find anything missing. That means I don’t need to install all my software and apps again. They were all there, but just wrapped in new visuals. During my initial hours of using, Windows Store used to run on its own and I did have to close it every time. But it was successful in hurting initial experience. Later, an update fixed it. The Office was working as it should be and there was nothing new as I was using a very older version (2007). But those new sharp edges still managed to change the overall look. After starting my system on the second day, one thing I did notice, was that Keyboard lights were not working anymore. Yes, those three lights on the top right side of every Windows compatible keyboard, they weren’t lighting up. After 5-6 days of working without those lights, Microsoft released some fresh updates and they were live again. The new update also brought all new Internet Explorer (Project Sparta), Cortana (Voice Assistant), performance improvements and fixed lots of bugs. Out of few things I didn’t like, was that there were two different versions of Skype, as I accidentally installed it from Windows Store while my older one was also there (from my Windows 7 install). This thing followed me from Windows 8 (I did use Windows 8 for around 6-8 months on my Vaio laptop). Moving forward, thankfully, I found all my PC settings in Control Panel, just like I wanted. But OS still managed to place few settings (also few important ones) into that another PC Setting section (remember full screen setting in Windows 8 and 8.1?). Of course, it took some time for me to remember which settings I can found at two of the platforms. I also noticed few new icons in Control Panel for older settings. The full-screen Setting platform does have some useful controls which were never part of Control Panel like Storage Sense (calculates and displays total storage), etc., but still, I wanted all of them on single platform. Storage Sense is a good inclusion but not that great and useful as we are still in habit of keeping an eye on storage part right through the My Computer (This PC) section. Also, My Computer is gone. It has been replaced by ‘This PC’. I tried painting using Paint, which was sadly untouched (not a single new feature) and I managed to draw things just like old times. The Search tool is pinned right in the Task Bar and it works great. Those days are gone now when we have to go on a search for the Search tool itself. Sometimes, I did find ‘Something went wrong’ message, but overall it was functional (after all it’s a technical preview). It can scan through local files and it even showcase related information from internet. Those suggestions were good and helpful, every day. Recently, few more updates got installed and Search tool was working without any issues, even at the moment. Calendar and Time view and setting sections are untouched and they are all same from Windows 8.1. I didn’t find any new setting or improved icons or visuals, just those sharp edges. File Explorer is further improved. At This PC section, a list of Local Drivers and secondary storage devices were there which all were connected to the system. I also noticed few new icons around there, and they do offer a fresh feel, together. OneDrive (the new fancy name for SkyDrive) is integrated by default and it tries to work like iCloud in Mac. The attempt is good so far, but it is yet to cover a long path to reach iCloud’s simplicity. One more thing I did notice was that every application or software opens in File Explorer, initially, and then it moves back to its native Window screen. It was a little thing, but I have to share with you. Task Bar was having Start button followed by Search tool, and it also got Quick Settings option added by default. I did found that even if you are using an application in Full-Screen mode, Task Bar is still there for the rescue. Just like Mac, Windows 10 also has the notification centre. It can display birthday reminders and many more productive ones. Of course, it needs to access data from our email account. Notification Centre is a good inclusion, but I would like to see if Microsoft can add some unique features there which are not part of Mac till now. Cortana is another fresh arrival. If you remember it from Windows Phones, then it’s a digital assistant. It can listen to our commands and can fetch results from internet. Not to forget, there is no Siri for Mac platform as for now, so Microsoft is getting one step ahead with including Cortana right into the Windows for computer platform. With these two features, it is clear that Microsoft is all set to bring its PC and Windows smartphones pretty close and wants to keep them synchronized. This feature is inspired by OS X on Mac platform, but it is really useful, no matter which platform we’re working on. It can quickly showcase all working Applications, File Explorers and Softwares and even allows to switch between them. I even tried our earlier Task View shortcut i.e. pressing Alt + Tab keys and I did found that functionally, both were same but, different in look or design. During first few days of using, Task View wasn’t working at its best, may be because of some bugs but later I never realised of its existence. Learning from Linux and Unix based OS, Windows finally gave space for multiple Desktops. This was a cool feature I first got introduced to a Linux version and I really found it useful. I was allowed to open as many Desktops as I could until the ‘Add’ button disappeared from my screen’s scope. It will help all those productive workers like me who have to open a lot of software and applications and then it just becomes very hard to manage each of them in a single desktop. One more feature that Microsoft kept here from Windows 8/8.1 is Store. It got few more new apps and games and it seems like getting matured. Apps like Facebook (official), Netflix, Mail, Skype, Pandora Plus, Plex, Afterlight (Paid), etc., are in there and its enough for you to trust Store’s growing age. I even found popular antivirus like McAfee, Norton and Kaspersky in there. Once a new app or game is installed, OS even informs of its status through a sweet Notification. The only thing I didn’t like at all was that there were two scroll bars in the Store, each of them for the different axis of scrolling. But I’m pretty sure that this issue won’t be part of future updated version of Store. An all new Mail application is there which is really cool in look and useful as well. I can guarantee that after setting up your account there, you won’t be accessing emails through browser based mail clients. I really liked the Add and Delete animations with every thread in the Mail app. In short, it was a pleasing experience using default Mail app. I was wondering if it came from Microsoft Office, and then I forgot to confirm it. After 3-4 major updates, I got a chance to use all new Internet Explorer (codenamed Project Sparta). In many ways, it looked like Safari to me but there were still few major differences in design, of course. During my first few hours of using, everything worked good and it even dared to ask, if I wish to make it default. And then I switched back to Chrome. Still, the new Internet Explorer (or whatever its name will be) was pleasing and cool. So, that was my whole experience with Windows 10 Technical Preview so far. Sorry for being specific during the review as I wanted to share my personal experience with you. Finally, I can say, Windows 10 is the future. And it seems to be capable of stopping users from getting away. 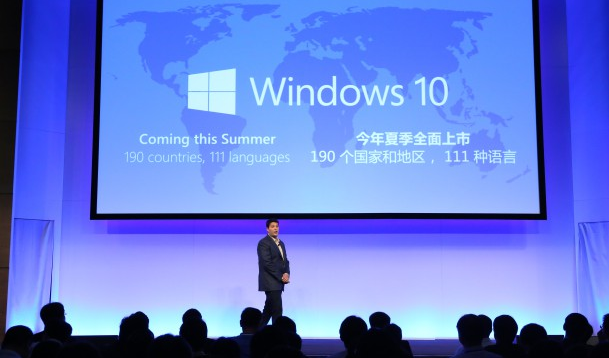 According to the official announcement, Windows 10 is coming this summer in 190 countries and in 111 languages. 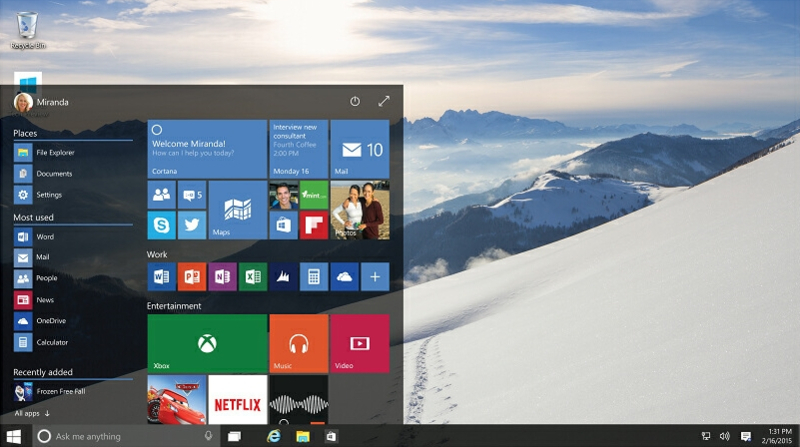 Once Windows 10 is available in fully capable version (i.e. out of beta stage), I’ll definitely share its review with you. Stay tuned.